Either way, we should get a large move from this technical pattern. Unfortunately, the technical pattern in the chart allows for a large move in either direction depending on your interpretation. A contracting triangle which I have above, implies a much larger move higher. The other interpretation says the bull market ended in January and the up/downs in the chart pattern above are a pre-cursor to a collapse once we break below the low ticked on February 9th. Back to the fundamentals. Both the jobs report and the ISM released this week point to higher input costs for corporate America which may lead to lower profitability (earnings) due to inflation. The paradigm of rising interest rates and inflation at the same time is something the stock market has not wrestled with for decades. Comparables to 2017 earnings in the second half of the year will be tough if inflation continues to challenge margins. The other side of the fundamental coin is that tax cuts for corporate America spurn large amounts of investment that have a multiplier affect on the economy and we get GDP running well above 3%. I will admit that the technical pattern will be much easier to analyze once we break higher or lower – more on that down the road. 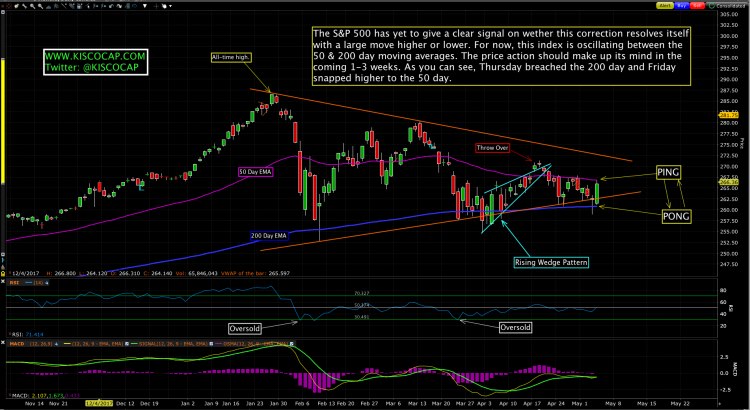 We closed on Friday just below the 50 day. We should have a minor pullback on Monday and the continuation of the rally later in the week if we have a shot at a sustainable rally to new highs. 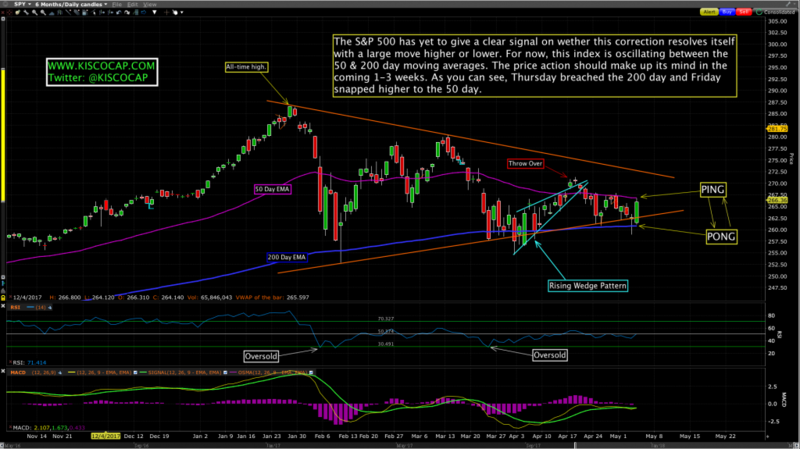 A roll-over of prices lower early in the week opens up the possibility of a much larger move to the downside if we breach the 200 day moving average. Another gauge of inflation is released on Thursday – the CPI. Watch gold, oil, steel and other commodities for their reaction. Earnings. Still lots of earnings coming down the pike. Earnings have been good, reactions to earnings has been mixed. The personal consumption expenditures price index (PCE) had its strongest level in 17 months for March, further boosting the case for US policy makers to increase rates 2-3 more times in 2018. The core PCE, which excludes the volatile food and energy components, jumped 1.9% on the year last month, according to a report from the Bureau of Economic Analysis. A forward-looking indicator of previously owned homes rose at a slower than expected pace in March as tight supply of homes and severe winter weather in the north-east weighed on activity. Pending home sales, or signed contracts for homes where transactions have not yet closed was up 0.4% in March. While strong job creation and improving wages are drumming up demand for homes a lack of choices because of tight supply continues to curtail home buying activity. Mexico’s economy shrugged off election and Nafta jitters to grow a stronger-than-expected 2.4% in Q1 which was above the market forecast of 1.7%. The latest good news – coming on top of a larger-than-expected trade surplus, declining inflation and a peso that has bounced off recent lows – comes as expectations of a deal on NAFTA is imminent. The Federal Reserve signalled it is getting more confident in the inflation outlook as it prepares for further increases in short-term interest rates in the coming months. The US central bank said that price growth has moved close to its target and is likely to stay there in the medium term as it held short-term rates unchanged at 1.5 to 1.75%. Argentina’s central bank stunned markets by raising its key borrowing rate to 40% on Friday, intensifying its efforts to defend the peso as emerging market currencies were hit by waves of selling. T-Mobile struck a $26 billion deal to buy Sprint in a combination that, if allowed by antitrust enforcers, would leave the U.S. wireless market dominated by three national players. The US Treasury is set to borrow an additional $33.9B from investors to accommodate the government’s rising borrowing needs and will introduce a new debt security to help cope with the rising funding requirements. The rise in debt issuance continues to be front-loaded on short-dated securities, with the sizes of the two- and three-year note auctions expected to increase by $1B per month. Exxon Mobil (XOM) and Saudi Basic Industries Corp. says they are moving ahead with plans to build a new $10B petrochemcial complex near Corpus Christi, Tex., and are forming a joint venture centered on the project. The project will include a 1.8M metric tons/year ethylene-capacity steam cracker, two polyethylene units and a monoethylene glycol unit. For XOM, the new complex is part of its plan to expand its manufacturing capacity along the U.S. Gulf Coast by $20B through 2027; for SABIC, the project allows it to expand its footprint in North American olefin and polymer markets.